The Eagle County Commissioners preside over a public meeting June 26 on the Tree Farm application. The board voted 2-1 to approve the project, against the advice of the Roaring Fork Valley Regional Planning Commission. Eagle County has declined to reappoint two veteran members of the planning commission for the Roaring Fork Valley just as that volunteer board is undertaking major projects. 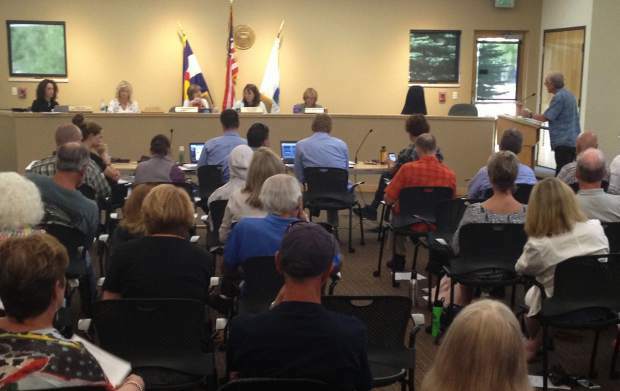 Cathy Markle and Raul Gawrys said they were “shocked” when they learned they were no longer wanted on the Roaring Fork Valley Regional Planning Commission. The landscape architect and land-use planner was appointed to the planning commissioner in April 2014. She reapplied to serve a two-year term but was informed by Eagle County Community Development Director Damian Peduto last week that she wasn’t selected. Peduto said the appointments weren’t based on past actions but were forward-looking. Phillip Ring, who works in construction services, and Curtis Vaughn, an architect, were appointed as voting member along with Temple Glassier, a longtime member of the board. New members Robert “Bob” Andre and Michael Luciano were appointed as alternates on the board. The change in direction came as the planning commission is preparing to look at the Mid Valley Area Master Plan and determine if parts of it need updating. That document guides where and what type of growth is allowed in the Eagle County portion of the valley. In addition, a consultant for the county recently produced a report that said parts of the Eagle County land-use code should be tailor made for the Roaring Fork Valley. The planning commission will dive into that, as well. Peduto recognizes that the changes might come across as political retribution but said the goal is to get broad representation and experience for work on the master plan and code updates. “I’m asking you to look at it broader,” he said. Eagle County commissioners Chairwoman Jill Ryan was in meetings Monday, according to her office, and couldn’t immediately be reached for comment on the appointments. Markle and Gawrys said in separate interviews it was unusual that the appointments were made without the commissioners interviewing any of the 11 applicants. Peduto confirmed the decisions were made off just the applications. The planning commission advises the county commissioners on land-use matters in the Basalt and El Jebel areas. The boards have sometimes been at odds since applications started circulating again after the Great Recession. The planning commission advised against approving the first round of approval, called sketch plan, for a residential project called The Fields, which could add roughly 100 residences across Highway 82 from Blue Lake subdivision. The commission also recommended denial of Ace Lane’s Tree Farm plan for 340 residences and 135,000 square feet of commercial space. The county commissioners approved both projects, though The Fields is now snared by a temporary moratorium on the review of land-use projects. The two boards met in April to discuss relations. Planning commission members said they felt the county planning staff advocated for applicants rather than the public at time, that the staff doesn’t properly convey the commission’s deliberations to the commissioners and that the commissioners ignore the planning commission’s advisory votes. At that meeting in April, Markle said the planning commission members have historically felt “devalued” because their work was ignored. 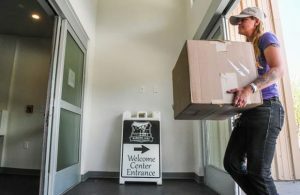 However, she said Monday she felt the current county commissioners made more of an effort to understand the Roaring Fork Valley constituency — at least until the votes on the two big projects. “Clearly we felt the (planning commission) and (Board of County Commissioners) weren’t on the same page on those ones,” she said. Gawrys has been outspoken about how he felt some members of the county staff tried to limit the planning commission from a broad examine of development applications. He regularly asked questions and challenged projects at meetings on technical issues, such as street widths and development density. He said Monday he feels the county treats the Highway 82 corridor like the Interstate 70 corridor in the heart of Eagle County. He also said the Roaring Fork Valley portion of the county might have a different view of development than most people in the main part of Eagle County. Gawrys and Markle said they believed they were effective planning commission members who did their homework and showed up diligently for meetings. “I don’t understand why you would approve crummy projects,” Gawrys said. He said he believes he wasn’t reappointed to the planning commission for speaking up. “The message has been sent,” he said. Markle said she felt the joint meeting with the commissioners had a “very positive outcome” and the planning commission and county commissioners agreed to steps that would improve communications. She said she is uncertain why she wasn’t reappointed but would like to hear from the commissioners what more she had needed to do to earn reappointment. She said she gave every application a fair hearing and based her decisions on county standards. “I’m not pro-growth and I’m not anti-growth,” she said.